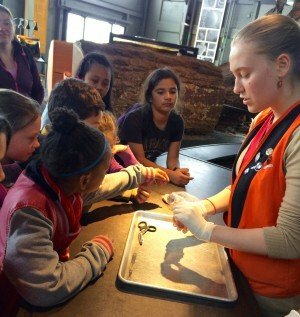 Last week I watched a 16 year-old girl dissect a cow’s eye in front of a bunch of 6-12 year olds at the Exploratorium in San Francisco. It was gripping seeing her pulling bits of muscle and fat away from the eye to show the third eyelid and then removing other parts to reveal the lens, optic nerve and back of the eye, which was a beautuful turquoise colour. For 20 minutes the kids surrounding her were literary on the edge of the bench, all the time drawing in closer and closer, as she revealed and explained more about how the eye works. At one point, she slit the eyeball and some black sticky stuff spurted out, narrowly missing one of the kids – to which they all squealed with delight. It added to the excitement and suspense. At another point, she had them all in the palm of her hands as she explained how we see with stereo vision. She also asked them lots of questions to which hands shot up to the sky to give an answer. Why do cows have a third eye lid? The answer: to protect them from scratching their eyes when grazing harsh and prickly grass. I’d never thought about it in that way before and that has stuck with me since – making me want to find out more about what other animals have them and why we humans don’t have one (we don’t need one since we don’t put our heads in thistles to munch all the time). At the end she revealed the lens – as if it was a jewel – and got the kids to look through it to see upside images of themselves that she then got them to think about why they were not the right way up. The girl who performed the dissection did so with great skill. She was also an excellent teacher. 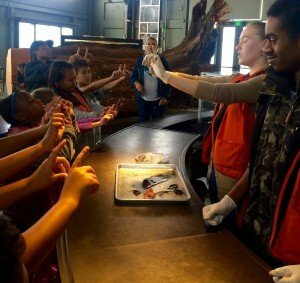 She is hired as one of about 50 teenage explainers who work for the Exploratorium and who have gone through hours of training to learn how to engage members of the public in science. It is part of a programme started by Frank Oppenheimer, who was the founder of the Exploratorium and who believed that only through explaining to others do you learn at a higher level. You also learn a lot more about the people who you are explaining to – what they understand, what intrigues them, what they find difficult to understand and so on. At such a young age, explaining in public to whoever comes along helps them develop self confidence and social skills in approaching people, listening and talking – all fundamental skills that everyone needs to learn. Later that evening, I watched a YouTube video of another teenager explainer dissecting a cow’s eye (there are several). While her explanation was very clear and followed more or less the same script as the one I had watched live there was something missing. The audience. In the live show, I could not help observing how the kids were so gripped by the dissection and how they kept getting closer and closer to the action. I also noted how others came to see what was so exciting and stood on the benches or squeezed in whatever space was available. A special learning moment for explainer and audience. It was without question something that will stay with them forever and hopefully for some whet their appetite to learn more about the fascinating world of biology. I was struck that even though explainers, teachers and members of the public can present on stage or in front of a camera it is never the same as being there in the moment when you can ask or answer questions, actually feel the eyeball in your hand, smell the liquid as it spurts out and talk about it to whoever is standing or sitting next to you. While you can learn a lot from watching videos these days you can never capture the wonderment that is central to wanting to learn more and importantly, be able to explain to others.